Looking out from cottages between Norway's Road and Great Oak Lodge Lane to Telegraph Narrows. (Right click to get a larger image). A quick snooze before moving on? A bed in a wrecked cottage between great Oak Lodge lane and Norway's Road on the abandoned railroad. An old cottage looking out onto Telegraph Narrows and Big Bay, between Great Oak Lodge Lane and Norway's Road, on the abandoned rail line. Clouds are reflected in the water covering the rail bed to the west of great Oak Lodge Lane. When I walked this on March 5, the ice was white and hard. Three days later, the meltdown had begun. Just east of Deseronto along the lake waterfront is Tyendinaga Mohawk Territory. The ancestors of the Mohawks who live here originally lived south of the lake. The traditional name for the Mohawks is Kanien’kehake, which means People of the Flint. The British dubbed them "Mohawk" which comes from the Algonquian word Mohowauuck which means "man-eater." The Mohawk are divided into three clans: the turtle, the bear and the wolf. They were mostly farmers and trappers, but were also noted for their fierceness in war. The Mohawk are part of a five-nation confederacy, which is so old it cannot be definitely dated. The other members of the confederacy are the Oneidas, Onondagas, Cayugas and Senecas. The confederacy was formed to forge a peaceful coexistence between neighbouring nations; it's said to be one of the oldest democracies in the world.The Haudenosaunee Confederacy, called the League of Five nations by the British, means People of the Long House. During the American Revolution, the Mohawk nation was an ally of the British. During this time, they were forced or decided to leave their homes south of the lake. Because of their allegiance to the British, they were given a number of tracts of land north of Lake Ontario. Today, they live in eight different communities, of which Tyendinaga is one (Information from Haudenausaunee.ca). "Captain John Deserontyon, a Mohawk serving in the British army, selected land here on the shores of the Bay of Quinte." On May 22, 1784, he and about 20 families officially took over the territory, although there is evidence Mohawks had been living in the area for 150 years before this. The land was originally 92,700 acres, but today is reduced to about 18,000 through "land alienations and surrenders." Tyendinaga comes from the word Thayendanegea, which, when literally translated, means "placing the wood together" in one now-defunct native website, or in several websites something like "he who bets or places two bets." 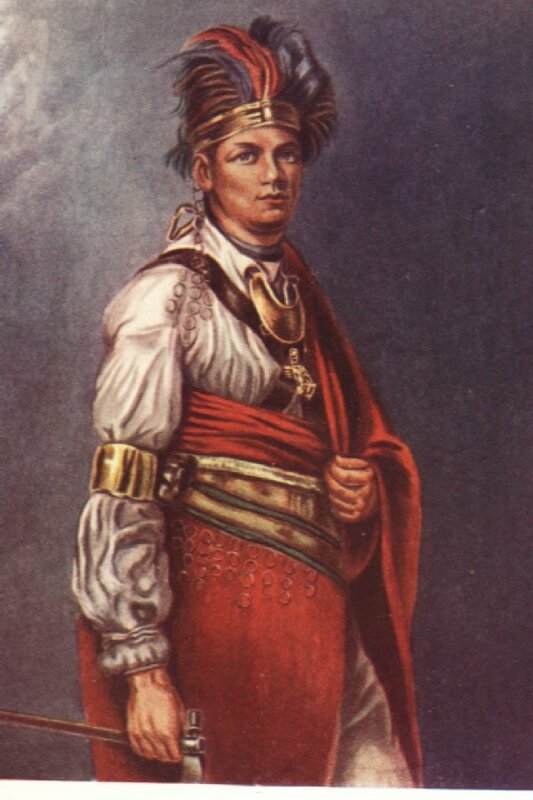 "Thayendanegea" was Captain Joseph Brant's Mohawk name. There are now about 6,000 Mohawks in the Quinte bay area. About 2,200 live on the territory. We depart from the official trail suggestions in Tyendinaga. The official route is still an undesignated section of the trail. The suggestion is to continue west from Highway #49 along Airport Road to Ridge Road and follow that west to Beach Road, where my route briefly meets with it again before heading off again across fields and down to Shannonville via Tom's Road.The official trail website describes the Ridge Road as a "busy road with narrow or no shoulders." It wasn't busy the day I drove it, but it looks like a boring walk along an asphalt surface compared to the abandoned railroad, . The road won't even give you a glimpse of places like Trident and Bluff points. The latter walks take considerably more effort, but there's also a much bigger payoff — and you are truly following the shore much of the way. Total:1.4 km (along the road). When you reach the airport, you have a choice: you can continue along airport road to Hickory Road. That's 1.4 kilometres. Alternatively, you can cut south down Johnson's Lane. This is longer but more adventurous. However, you have to cross private land and it's very marshy. I only just made it on March 23, with some still-frozen ground to help me. Perhaps the walk would work with boots in mid-summer. Before you walk anywhere, check out the dilapidated buildings just south of the airport on Johnson's Lane. They're falling down and empty for the most part, but it's worth a quick tour. The road is straightforward. Head west past Gordon's Road, over the bridge to Hickory. The shore route follows Johnson's lane south. When you reach the curve, you'll see a gate ahead of you. You can start bushwhacking here just beyond the gate, heading off to the right (west) to avoid the cottages by the shore as much as possible. With all the water, I had to use the road, but headed into the trees at a respectable distance. The marsh before you here is the toughest of the lot; if you can do this one, you're laughing for the rest. Once through this wet section, slow down and enjoy the shoreline. There are a few gnarly trees here and the vegetation runs to the water. This continues, with periodic wet spots for about a kilometre, until you run into a couple of small cottages. Along this section, you will occasionally see rough and often faint double tracks that will make your progress easier. Just past the cottages, start cutting north again through the scrub bush. There is a road running close to a house back from the shore, but you can avoid it by heading through the bush until you hit Gordon's Road. You have to head north again here to Airport Road unless you want to swim Sucker Creek. At Airport Road, you'll turn left, cross the bridge over Sucker Creek and half a kilometre later you'll meet Hickory Road heading south, and Airport Road curving north. (By the way, one of my topos — my Garmin Mapsouce Ibicus 2.0 — is seriously wrong here, so be careful. The free Ibicus 2.1 is more accurate.) The abandoned railroad can be clearly seen running off west in front of you. Airport and Hickory roads to Great Oak Lodge Lane: the abandoned railroad. I did this section three days after the section immediately following. A lot of changes can happen in three days as spring approaches. It’s something to be aware of in these sections. Temperature swing from below freezing to above freezing, with ponds rapidly melting and lots of runoff. It makes for a different walk every time. The abandoned railroad can be clearly seen from the junction of Hickory and Airport roads. It heads eastward and somewhat southward. This walk may be possible in the summer, but there may still be some minor challenges with water. I caught it just in time, with the ice carrying me over a couple of sections, as I’ll describe. Nevertheless, the spring runoff made for some interesting walking. Be warned. The sign at airport and Hickory roads, along with a Stop sign in Mohawk. Once on the bed and over a low (and dead) electric fence, the walking was easy. It’s pretty straight, but on grass, which softens the straightness. Several apple trees line the bed; at one point last fall’s apples still lay rotting on the ground. After this, the trail moves through woods and here the first serious challenge presented itself: a channel too wide to jump, with water on all sides of the trail. After a brief attempt to make a bridge from fallen logs, I took a chance on the ice on the south side of the bed, where the water was flowing slightly less. Using my expedition poles to test as I went, I found a reasonably solid path. The ice was at the point where you can delineate black (and dangerous) ice from white and more solid ice. A break through the ice would probably have landed me in about two feet of water. Once through this, the landscape opens to fields to the north and marshy land to the south. There are signs of cattle here. A second water channel has some serious barbwire blocking the way, but a couple of dozen feet to the south, the fence has collapsed, so it was easy to skirt around it. The ice helped me here also; it was still holding up in the ponds near the bed. A third very straight runoff creek running fairly fast had me working hard and moving quite a bit south to find a place to ford it safely. The width was just a couple of feet too wide to jump. Again, the frozen earth made it a bit easier; when it turns to mud, it could be very difficult. From this point it was easy going. The bed now drops below the field level, but it was easy to move to a berm to the south that rides above the wet and takes you almost to Norway’s Road and the 3 km point. There’s a wire fence at Norway's Road, but someone has opened a space to step through easily. On the other side of the road, the trail gets muddy and a few dozen feet in there’s a pile of dirt that needs to be climbed. The trail runs high over wooded sections, with fields not far beyond to the north. Soon a metal building belonging to Quinte Bay Contract Flooring comes into sight through the trees, square in the middle of the trail. The trail, by the way, is periodically slightly overgrown with small trees. You can drop down off the trail to the right, cross the road and skirt around the building to where the trail picks up again. Very shortly, you’ll come to another drop in the trail, this time (in spring anyway) with another runoff creek to negotiate. I used a big piece of floating ice to quickly step across. Once on the other side, you’re into a small cottage zone. Most of the cottages are in extreme disrepair or have collapsed. There are also a few old trailers strewn about. I met a couple here. Neither were from the area. The woman was busy photographing the decayed buildings. I wandered through a few buildings, then went to test the ice off the shore to see if I could safely skirt a pretty active creek and inlet cutting through the cottage zone. The ice was safe. However, later in the season, the only way to safely cross this section would be to walk up to the Ridge Road, which is not very far to the north at this point, and use the bridge. The bed continues beyond the first set of cottages. A second set of cottages are better ordered and preserved; people were moving about on one of the properties. The trail runs behind their cottages and shortly thereafter two roads head north to the Ridge Road that runs just to the north. The road at this point is hard, with a cinder base, but beyond the cottages, it returns to grass. As it moves back to wooded area, a small ad hoc dump has been created, with stoves and washing machines tilting into the water on the south side of the trail. It’s unfortunate, because immediately after that is a grand old oak spreading across the trail. It’s necessary to duck under it to get through. Then it’s an easy walk, again with fields peeking through to the north and a lot of water amongst the trees to the south. A house appears to the north through the trees and a rough road crosses the trail. There’s an old farm tiller subsiding back to the earth here. Shortly afterward, there’s another stream coursing across the trail. This one would have been pretty impossible to ford. Luckily a long railroad-tie sized piece of timber stretches across the water here, making the crossing easy – and fun. Keep left when you get off the log and skirt the pile of dirt to get back to the trail. In a minute’s time, you’ll meet Great Oak Lodge Lane. You can significantly shorten this bit by continuing the abandoned railroad from Great Oak Lodge Lane, cutting off both Bluff and Trident points. The railroad is a bit straight, but a good walk across grass. The marsh will be on your left, and fields will spread out to the road to the north. I did this with solid ice to carry me across the wet bits, so it was an easy walk. In warmer weather, I think there may be insurmountable water to cross, at least just after Great Oak Lodge Lane. Once on the trail and past some initial brush, the view of the lake and the marsh was good; if you’ve already walked Bluff and Trident points, you’ll recognize some spots on the shore. As you get closer to Beach Road, the trail twists a bit. There have been cattle in these woods/fields. You’ll pass through a gate onto the road that leads on the left to Trident Point or straight on to Beach Road. A 500 metre walk will get you to Beach Road. A much more satisfying walk will take you around Bluff and Trident Points. I walked the railroad westward, but took in the two points on my outward journey. However, I’ll relate it heading westward here. Head down Great Oak Lodge Lane from the abandoned railroad. It winds around a bit and a road heads off to your right. As you get closer to the water, you’ll see houses on your left. The road leads between houses almost to the water. At the one kilometre point, you’ll be at the lakeshore at Bluff Point. Trident Point will be off to the west and Big Bay beyond that, which is part of the much larger Bay of Quinte. Across the water on your right as you look out is Quinte Point, the northernmost part of Big Island, tenuously attached to Prince Edward County by marshland. On your left is the (almost) island of Prince Edward County. Drink this in. You’re on private land, so probably won’t get too much of a chance to catch this view too often. It would be possible to walk the little roads between the houses to get to the westernmost house on Bluff Point and avoid walking on the ice. The actual shore has a steep bluff at one point and it’s unlikely you could slide along the shore the entire way. The ice was very solid on the day I walked this bit, so from the end of the road, I walked along the ice to just past the last house to a point where I could walk up, keeping a respectful distance from the house. From there, a bit of bushwhacking through scrub and trees will get you to the edge of a marsh. This section would be impossible in any time but winter, unless you have hip waders or fancy a bit of swimming. In winter it’s a cinch to walk across the mouth of the marsh; it’s very safe when the ice is thick and there are lots of open routes to take. The marsh stretches back to the abandoned railroad, so it’s something to deal with any time but winter. On the west side of the creek, you’ll have to skirt an electric fence before coming upon some grand old trees at the water’s edge, followed by a few trees and open stretches, before the landscape opens right out into field and swamp. There are signs of cattle here. The walking in winter is easy, over grass and frozen marsh and along the shore. In warmer weather, this would be a muddy section, but it was good and solid in early March. A lone fish hut sat on the shore and there are lots of signs of humans here: the occasional old tire, plastic containers and vehicle tracks. Mine were the only footprints along the shore. At Trident Point, there is a single tree, and a duck blind. A little beyond that there is a small beach made entirely of shells; obviously a popular spot for gulls. The thousands of bleached and broken shells were impressive. Trident Point is about 2.5 km from Bluff Point, walking along the shore. Just beyond the shell beach is a fence that is easy to walk around from the water’s edge. Several cottages dot the waterfront here and the road winds behind them. Follow the road until it establishes itself a bit more beyond the last cottage and turns away from the shore. You’ll wind about for 1.5 kilometres from Trident Point, where the road takes a sharp left. On the right is a gate and the abandoned railroad heads off to the east. Another 500 metres gets you to Beach Road, just east of the mouth of Marysville Creek. From Beach Road just east of Marysville Creek, walk along the “causeway” at the water’s edge. Marysville Creek has a control dam at the bridge and a sign indicating you are on land belonging to the natives of the Tyendinaga reserve. Beach Road curves northward. At about 2 km from Marysville Creek, you’ll have to judiciously decide how to cut through some houses to get to the fields beyond. Your objective is Tom’s Road to the west. I first tackled this from west to east and naturally came out at Beach Road, skirting houses as best I could. Perhaps if you asked at around 268 Beach Road, the occupants could help you out. I talked to a resident of the area at Tom’s Road and told him my objective. He was extremely helpful and friendly. You’re on private land here, so a little friendly conversation goes a long way. The stretch to Tom’s Road (also Toms Road, both spellings are on signs) follows field edges and at the end there’s a definite track. Unfortunately we (I did this bit with my son Matt) ran into a lot of poison ivy, especially near Tom’s Road, which slowed us considerably. From Tom’s Road, it’s a straightforward and not particularly exciting walk into Shannonville, turning right into Queen Street, then left onto York Road. There are some houses in Shannonville with real character. Check out the houses on Queen Street, sitting between the road and the Salmon River. The rapids at the bridge are picturesque, especially in the spring. (See below for a little park on the shores of the Salmon River. I’ve ended this walk on the bridge, but the park would be a natural stopping point. Rating: Easy. some interesting houses. Bridge on York St. over Salmon River in Shannonville to inner entrance (road just north of guard building) of Lafarge Cement. From the bridge, I headed north, then cut west down a sideroad, heading for Shannonville Centennial Park. This is a nice, open grassy park on the shores of the Salmon River; it's a good place for a picnic in the summer, although there aren’t many trees if you want to escape the sun. From the park, I backtracked briefly and headed west along a trail. A large marsh on the western shores of the Salmon River kept me from sticking to the river bank. Two large ponds on the west shore connect to the river but are away from the main section of the river. They also serve to keep one away from the river proper. The east shore of the river is lined with houses and cottages. At one point you can see the large and long wetlands that line the river as it reaches the lake. The northernmost pond has very even banks that look as if they have been artificially created. A section of the north bank is made up of flat rock, where I met up with a Canada goose who greeted me with loud honking. A fence is at the end of the southernmost flats and I followed it back north until I met the hydro line. The hydro lines led me northwest and I got fairly close to the highway and parallel to a gas station before I cut south across a big field to meet the hydro lines again, this time heading south and west. I had to negotiate a few easy fences along the way, and there is a marshy section and a little stream that can be crossed using a rough-and-ready bridge just south of the hydro lines. After the bridge, I followed the trail as it passed through some trees south of the hydro line, until I met a fence. Beyond the fence is a field. I followed the hydro lines west, although there is a more interesting route along a small gully that was once a rail bed, which I have described in my south route. When the hydro line meets the gully, I cut across it until I reached a fence. Once over the fence, walk slightly left to pick up the old rail bed, which will become a berm that allowed me to cross a larger marshy section. The rail bed is an excellent walk. Trees have grown up on the top and along the sides, but a trail winds along the top. It’s the best of both worlds: dry feet, a lovely path through arbor-like trees and a marsh humming with life on both sides. Beyond the rail bed, I picked up the hydro lines again. When you reach a road, head south. The road will take you to a subdivision in its early stage of development; no houses yet (as of 2005), but rough roads and piles of dirt and gravel. There are a couple of beautiful trees by the lake. This is a little garden of Eden that will soon be obliterated by the developer’s shovel. To the west is a basin with artificially-built banks, a harbour for the yachts of the residents-to-be, I imagine. Interesting how developers get to mess with the lakeshore this way, when cottagers can’t even dump a load of sand on their shore without government interference. I imagine that money talks and there are all sorts of good reasons drummed up by the appropriate ministries to make this environmentally allowable. From the basin, I headed westward and back to the hydro lines through some scrub pines. The lines come out at a gravel road just behind the guard’s gate at Lafarge Cement. I turned left and walked to the junction of the road and the yield sign just north of the guard’s house. Rating: The railbed is the best bit. From gates of Lafarge Cement (at guard gate, not Old Highway #28) to east end of Point Anne Rd. and on to Manley Dr., (just beyond boat launch, at the turnaround point just before the road narrows). The gate to the Lafarge Cement plant has a weigh scale that looks like it might be used. The quarry to the right (west) as I walked south is still active; however, the buildings, a double “silo” and the cranes near the waterfront look deserted. Just to the east and north of the silo is a flat area that has been backfilled; I suspect it was once a marshy area, as the marsh further to the east starts abruptly at a very straight bank. This is wasted land; it may have made somebody a passel of money at the turn of the century and on up to the seventies, but it now is a disgrace to the waterfront. What in God’s name is a place like this doing disfiguring the lakeshore? It seems companies, at least in the past, could destroy the landscape and just waltz off. But Lafarge still operates, so this isn't a thing of the past. They should be forced to fix up the property and hand it back to the public – at no cost. They’ve made enough from it already. There are a number of collapsed cement buildings here and there on the property, and a rail line coming in from the north. Apparently this was once an electric railway. The quarry is impressive in a sad kind of way that quarries are: humans have gouged this great gaping hole in the landscape, leaving high cliffs that drop straight down. It looks like there might be more activity here, but still it looks rather deserted. Walking south and west toward the east end of Point Anne Rd., I had to negotiate a wire fence. There’s a parking lot along the fence line between the road and the Lafarge property and it was pretty full, with lots of fishers out on the bay for the first day of the spring season. As I got to the parking lot, I ran into five people looking for fossils. They were about to climb the fence into the quarry, but a lone man with a truck inside the fence put them off. It looked like he was coming back from fishing, but who knows what he was up to. The group decided to climb the fence at a point further down the road, behind some trees where they could be more discreet. They said they were looking for fossils and crystals within the limestone, and had a rock cutter for the purpose. One guy said he was from Toronto, another from Ohio. I headed west on a trail heading into the woods south of the road. After a couple of minutes, I cut south on a rougher trail and did a little bit of (easy) bushwhacking to get to the Point Anne Water Supply Treatment Plant, a small white building at the end of a gravel road about 50 feet from the lake. Just before the building I peered into a cement foundation with a cement roof and two squares in the top. I tried to shine my little penknife through one of the holes, but all I did was scare up a bat. It looked pretty empty. Beyond treatment plant a trail heads west. I kept as best I could to trails closest to the water, to avoid the houses to the north. This is a good walking area. At one point, I came upon a ruined building. All that remained was a flat cement floor and the north wall. It looked like a (very dilapidated) basketball court, with a big flat open space. There are a number of ruined cement buildings hiding in the bush along the first part of this route. After curving down a trail to the north, I cut back through a marshy area (and got slightly wet feet) to get to a little shed by the waterfront. Beyond this is a short but idyllic laneway that opens onto a lawn area. Here I headed back up the trail to the road. The trail comes out just east of a house that looks like it might have once been a church, situated on the north side and calling itself Swallow AB Works. From here I walked through the village, past a house that once was “L.O.L 2599” according to a sign on the front of it, and Point Ann (sic) School (that doesn’t look like it is being used as a school any longer). The stone building has “A.D. 1927” inscribed into it. Just before Manley Road narrows, a sign states, “Don’t even think of dumping your garbage here.” The laneway to the east (which I haven’t described here, but is worth walking) winds about to Ox Point, and sports a number of classy houses along the way. This is a fine walk (except for the highway bit). At the turnaround, just before Manley Rd reduces to a laneway, I followed the hydro line northward. This takes a bit of bushwhacking for about five minutes, until you come to a couple of trails. Stick to the one that follows the hydro lines. It is a bit muddy this year, but not too bad. There’s a little bridge at one point that allows you to cross a creek. Follow the trail through the edges of the marsh until the hydro lines head off north straight across the marsh and the trail curves eastward. While the route is still a tad mucky, you get a magnificent view of the huge marsh to the north. Unfortunately, there’s no way of crossing it short of heading to Point Anne’s Rd. You’ll walk through scrub cedar and little open bits; it looks like someone farmed this land many years ago. The trail will lead you to the road, just south of the houses lining the road to the south of Highway #2. The homes on Point Anne Rd. make up a quiet neighbourhood despite the nearness to the highway. At the northernmost house, I headed west through the field. This is not really a good idea. I wandered about trying to dodge first marsh and open water, then houses, before giving up and walking down a long private drive to the highway. I recommend walking from Point Anne Road to the highway and then heading west. The road makes for a boring final kilometre, but you save yourself a frustrating time trying to get around stream and marsh. Half a kilometre from the Baz Auto drive, you’ll walk over the highway bridge over Blessington Creek and see that (at any time of year) this creek would give you a run for your money if you had to cross it further to the south. Maybe there’s a secret pathway through the fields and woods, but I didn’t find it.